Five Steps to Naming Brilliance — Campfire & Co.
We've had quite a few clients recently grapple with the difficult task of naming a business. It can be one of the hardest decisions to make when you're just starting out or rebranding. Having a good process in place to tackle a naming project is a great place to start. We reached out to our good friend and brand strategy expert, Hillary Bleckley of Brand Apart, to get her perspective on the best ways to land an awesome business name. Thanks so much to Hillary for the tips below! If you’ve ever named a pet, a child, a playlist, or a brand, you know that naming is a subjective matter. It is a task riddled with opinions and associations. Perhaps this is why so many couples today refrain from sharing baby names – invariably someone has an ex-boyfriend or dog named Bennie. Despite its challenges, naming is a critical part of the branding process. A name serves as the initial brand trigger. It shapes identity and conveys meaning. It establishes the essence of your idea in just a few short words. But, effective naming is not relegated for the creative elite. Whether naming a product, a service, a brand, or a suite of brands, you can master naming with a few simple steps. 1. Establish your name objectives. All names serve a purpose. Some names convey an emotion, others tell a story. Some create intrigue and others communicate the facts. Start by identifying what you need your name to do for you. Is it to describe a functional part of your product or hint at a differentiator? Capturing this list of objectives will help later in the process, when evaluating which names to select. Remember that just because you like a name doesn’t mean it is the right, strategic fit. 2. Determine your name type. Names come in all types, from highly descriptive (Fresh Market, Bed Bath and Beyond) to evocative (Amazon, Dove) to fanciful (Apple, Yahoo). And they vary based on their construction, from combined words (Evernote, Verizon) to coined words (Kodak, Hulu). To bring focus to your brainstorming, determine first what type of category your name should fall in based on your situation and offer. If you are introducing a new product to market and have limited marketing budget, consider a more descriptive name. If you want to create a strong emotional connection, consider an evocative name. Given the competitive naming market (more than 300,000 trademarks are filed each year), more companies are turning to coined words. Honing in on the types of names will help guide your creative exploration. Which brings us to step 3. 3. Use territories and online resources to inspire possibilities. Naming without creative input is like driving a car with the refuel light on. You can go for a little while, but it’s only a matter of time until the gas runs out. 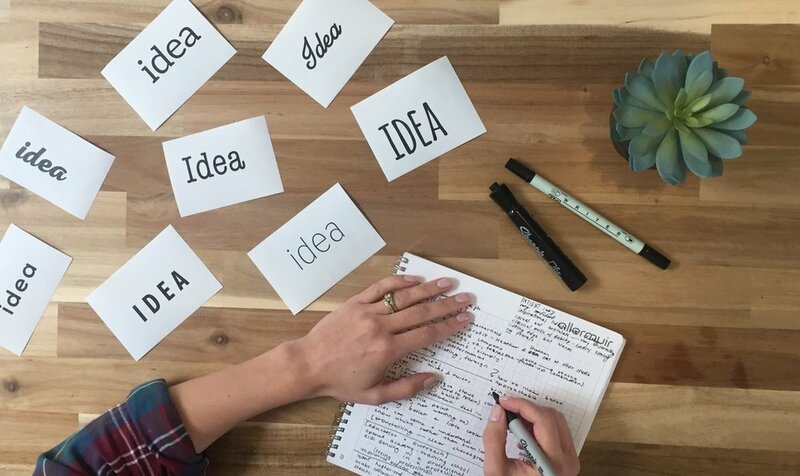 To avoid brainstorm fatigue, start by coming up with a list of 8-10 creative territories that will guide your name generation. Territories are simply categories that represent relevant topics of inspiration. They could include the value proposition, company values, differentiators, or visual associations. A recent client of mine was looking for a name for her new photography business, so before brainstorming, I came up with the following territories: light, vision, customized, image, among others. Then, I used each territory as a springboard for possibilities. What other things convey light? What are metaphors for customized? What is the etymology of image? The internet is filled with resources to answer these questions. A few trusty sites include: Oxford English Dictionary, visual thesaurus, and topic glossaries. Log your possibilities under each territory and before you know it you’ll have a rich and diverse set of name options. 4. Check trademark, domain and social media availability. Once you’ve applied your evaluation criteria (see step 1) and selected your top names, you’ll want to ensure the names are available for use. There’s nothing quite like getting excited about the perfect name only to find out it’s already taken (or worse being slapped with a cease and desist letter). Search your names through the trademark page of The United States Patent and Trademark site (a site filled with helpful info). Keep in mind you’ll most likely want to work with a trademark attorney for a more complete assessment. Next, check for domain availability. If your preferred domain name is already in use, consider adding a relevant qualifier to the domain, like consulting, design, or bakery. Lastly, with the prolificacy of social media, check if other products or brands are using your preferred hashtag or user name. As in all branding, you’ll want to create a consistent naming experience across all platforms. The process of naming isn’t to be feared. By following these simple steps, you’re sure to land on a name that is both strategic and inspired!